L.A. electric mandolinist Michael Lampert is back with more of the tasteful, graceful jazz that made his previous solo disc, Jacaranda, such a pleasure to listen to. While his style hasn't changed much, this release does find Lampert pointed in some new directions. For one thing, he's subtracted the electric guitar of Tom Bethke from his band, replacing it with Vern Waldron's delicate piano work. (There's also a new drummer, Jeff Fish.) Listeners will no longer face the challenge of trying to tell the mandolin and guitar apart. Bethke does appear twice on nylon-string guitar, a timbre that doesn't compete with the lush electric sound of Lampert's Schwab mandolin. 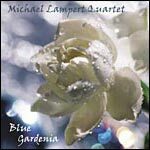 Furthermore, whereas Jacaranda was a collection of originals, Blue Gardenia focuses more on others' compositions, although Lampert's taste remains eclectic. "East of the Sun" is probably the closest thing to a jazz standard on the disc, and there's a delightful version of Fats Domino's "I'm Walkin'" where bassist Timothy Emmons takes quite a ride. Lampert's clean, perfectly balanced plectrum attack and precisely swung eighth notes put quite a shine on the tunes he's culled from the dustier corners of the jazz songbook. Lampert does contribute two originals: "La-Dee-Da" is a slow, simmering blues that'll make you long for pit barbecue, while the bright, ambling "Animation" demonstrates his ability to start a solo unobtrusively and gradually turn up the heat. As with the previous disc, Blue Gardenia gravitates toward understated, medium-tempo arrangements, yet earns the serious listener's respect: there's not a pretentious, sentimental, or cloying moment to be found. While Lampert isn't quite all alone in his field (New York mandolinist Andrew Hendryx covers similar sonic territory), he is a trailblazer both among jazz artists and mandolin players. And that's a rare, commendable achievement. If you enjoy jazz and appreciate mandolin playing, then Blue Gardenia belongs in your bouquet. 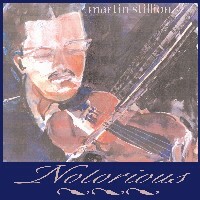 Pick it up at Mid-Continent Music or Elderly Instruments.